Well, with summer here, my wife and I were giving some thought to our bucket list. Yes, we do have a joint one. It’s to visit 50 countries and 50 states. Happy to say, we’re doing a good job so far, as we’re over half way on both. So, we thought to ourselves, let’s add a few more states to our list. We mapped out a pretty cool trip that I want to share with you in case you desire to see some of this beautiful countryside of our amazing nation. 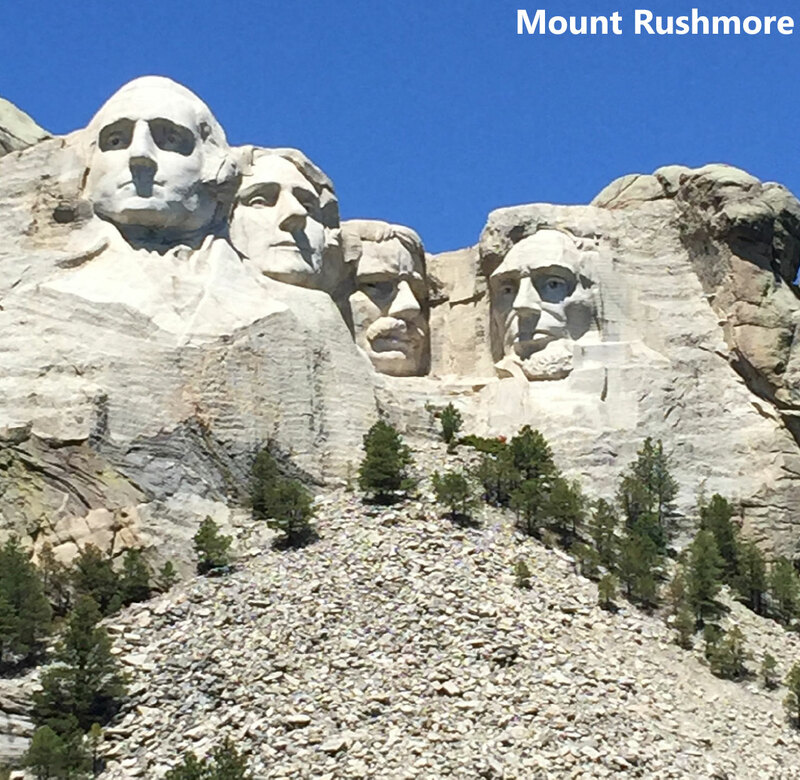 Our journey highlights will include: Yellowstone National Park and Mount Rushmore. Our itinerary will take us to Colorado, Wyoming, Montana, Idaho and South Dakota. Hold on … here we go! FRIDAY: We started out with a 7AM flight from San Jose to Denver. We decided to go with Southwest Airlines. They had the best schedule to get us there early. I had some business to take care of, so we needed to get there as soon as we could. Our flight arrived right on time. Avis was nice enough to upgrade us to a Mercedes E Class, which had navigation. After a brief meeting, my wife had us scheduled for a 2PM Tea at our hotel … The Brown Palace Hotel and Spa. I’ve had the pleasure of attending some tea functions with her in the past, I usually walk away hungry after eating bits and pieces of finger food. I will say this, however: this time The Brown Palace did an excellent job in filling me up with delicious finger foods and desserts. If you’re into being spoiled, you don’t want to miss this luxury hotel that comes with all the fixings like spa and salon and nice restaurants. You will want to check out The Brown Palace, conveniently located in downtown Denver. After our Tea, we strolled the 16th Street Mall for some delightful shopping. This is when it got interesting. For our night time plans, we had great seats behind third base at Coors Field to see the Colorado Rockies play the Miami Marlins. At game time, the weather was picture perfect. By the 8th inning, the roar of thunder and hail came out of nowhere. From sunshine to being drenched … Fans in the upper deck were asked to vacate due to lightning. Unfortunately, the Rockies were so far behind, we chose not to hang around for what seemed destined to be a lengthy rain delay. We headed back to the hotel … knowing we had a long drive ahead of us the next day … and a nice warm shower waiting for us before bed that night. SATURDAY: Today was pretty much a driving day, with our destination being the Jackson Hole Mountain Resort. After a long day, it was nice to have waiting for us a gorgeous roomy room, and an excellent fine dining experience. Now I know why this resort has such a wonderful reputation. SUNDAY: After breakfast at the hotel, we found a Starbucks … needed a good fix. Super, wherever we are. From there, we went to Teton Village to take the Tram. In no time, you will breeze up over 4,000 feet (actually just over 10 minutes) to the top of Rendezvous Mountain that stands over 10,000 feet. From there you can walk around and grab some awesome pictures. While up there I suggest you grab one of their “Top of The World Waffles” - the scent alone will force you to eat one. Oh, did I mention, they also serve hot chocolate and Baileys … “yummy”! We then drove for two hours to West Yellowstone, Montana. We had plenty of daylight, so we paid a visit to the Grizzly & Wolf Discovery Center. While some may think it’s a zoo, it’s really animals who call the Discovery Center home due to injuries where they are incapable of living in the wild. We got to see birds like Bald & Golden Eagles and Peregrine Falcons. Of course, the Bears put on a great show. The guides at the Center are informative and will answer all your questions. 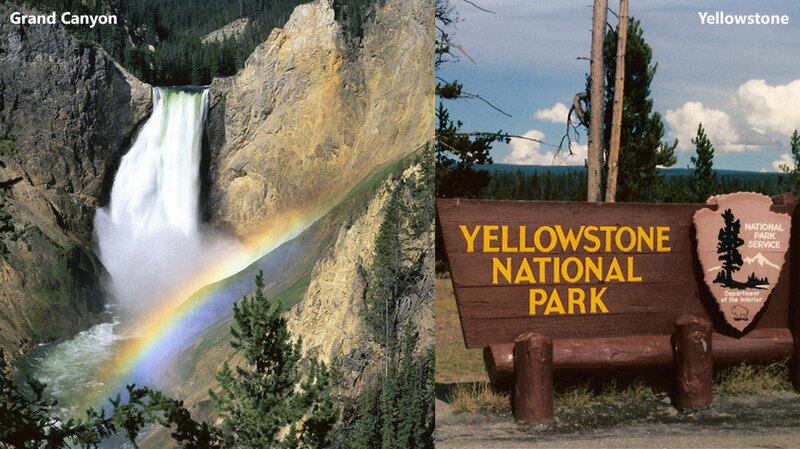 MONDAY: Today we had scheduled the “Lower Loop Tour” of Yellowstone National Park. One of the more popular tour guides is Buffalo Bus Touring Company. I was really impressed; our guide, Graham, was very informative; plus, the motor coach seated around 18 and was very comfortable. The tour isn’t inexpensive, but you will get a good 11 hours of education along with some fun humor. You can order a bag lunch or, as we decided to do, you can have a very nice lunch at The Village Lodge Mammoth. The upper loop of the figure “8” circles Mammoth Hot Springs, Tower-Roosevelt and Canyon Junction and Norris Junction then back to Mammoth. It is roughly 70 miles in circumference. 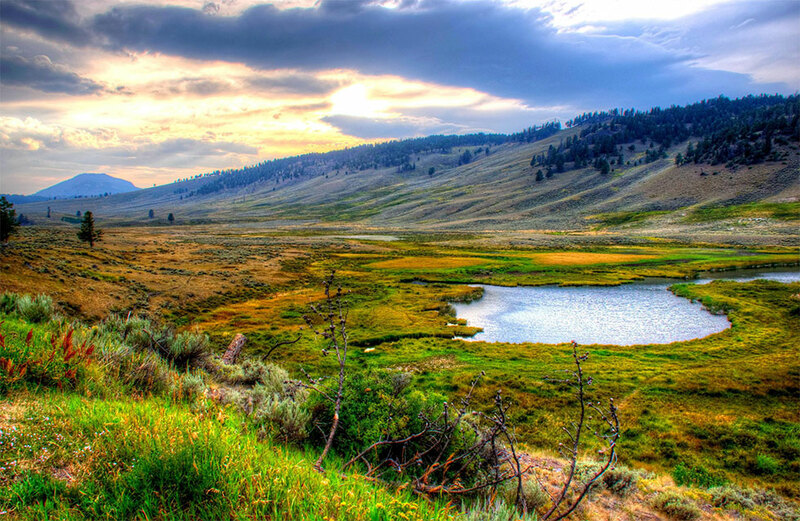 The Grand Canyon of Yellowstone is a must see. This is probably one of the most breathtaking sites in the entire park! At the Lava Creek picnic area through the Blacktail ponds area watch for two large bull elk which are often seen in this stretch; many bison frequent this area, too. We also saw some coyote along the road. We got back around 6ish, and based on a recommendation, we had a great dinner at the Madison Lounge. Fol-lowing dinner, we still had some time, so we went and saw “Yellowstone” which was playing at the IMAX Theatre. While in Yellowstone, we stayed at the Yellowstone Lodge, which is a few miles from the gate to the National Park. TUESDAY: Today, we decided to drive the “Lower Loop” of the park. We were able to get into some areas that the tour bus couldn’t. The Lower Loop is the more popular loop as it has the bulk of Yellowstone’s thermal features … Old Faithful being one of them … as hundreds of people gather around to watch. 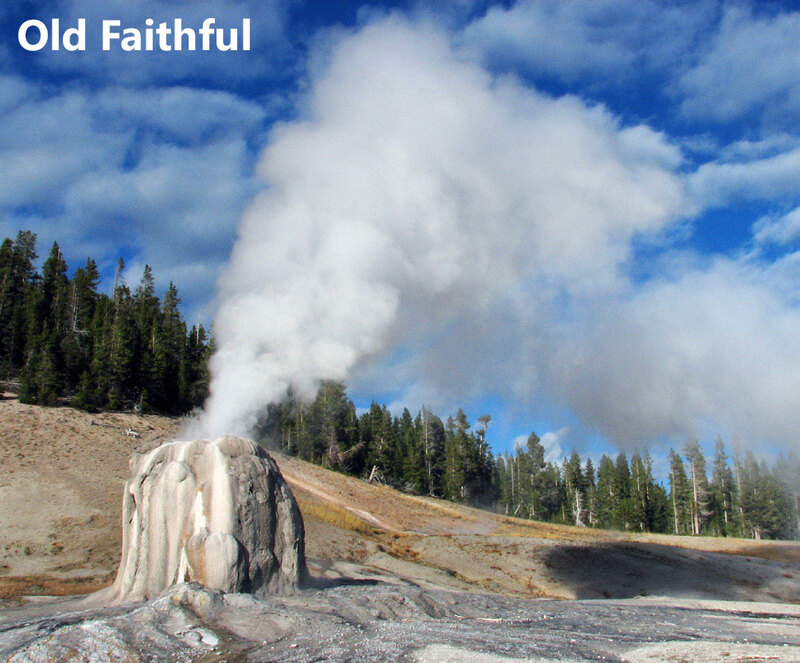 Some other areas of interest you won’t want to miss along the loop include: Firehole Canyon Drive, Fountain Paint Pots and the Lower Geyser Basin, Firehole Lake Drive and Midway Geyser Basin. Be sure to check out the Old Faithful Inn Resort, as well … there are great restaurants in the area. Wednesday: Today, we’ll be doing a good share of driving … and we’ll end up in Deadwood, South Dakota. We decided on this route because we wanted to stop off and visit the Battlefield National Monument. This, of course, is where the Battle of the Little Bighorn took place … also commonly referred to as Custer’s Last Stand. We pulled in at the perfect time as a Ranger was about to give a 30 minute lecture on what happened that day in the field. Along with the monuments, you will see the gravesites of the soldiers who died on the battlefield. We pulled in around 5:30PM at the Holiday Inn Suites & Gold Dust Casino. Once you make your way through the casino, and take the elevator up to the Hotel Lobby, it’s like stepping into another world. We didn’t expect the hotel to be so elegant. We reserved a suite that had a bar and kitchen. If I ever get lost and end up in Deadwood, South Dakota … I’ll be staying here again. Adams House Museum: The memorabilia here has been very well preserved. Lots of history in this old Victorian house. Mount Moriah Cemetery: About 100 yards from the opening you will find the burial place of Wild Bill Hickok, Calamity Jane, Seth Bullock and other notable figures of the Wild West. For lunch, we ate at a local restaurant owned by actor Kevin Costner called The Midnight Star. The food was excellent … if you can get in, I highly recommend it. After spending most of the day in Deadwood, our journey continued to Rapid City, South Dakota, and the Marriott. FRIDAY: Today, we set out about 20 miles from our hotel to see a site my wife has been wanting to see for quite some time … Mount Rushmore. It is such a beautiful site. Rangers are there to answer your questions, you won’t have a problem getting a good picture, as well. There is a little bit of a wait to get into the park. While there, you can enjoy checking out a film on the history of the monument, along with visiting the museum and gift shop. We had lunch in the town, just outside the park, called Keystone. I highly recommend eating at the Powder House & Lodge. 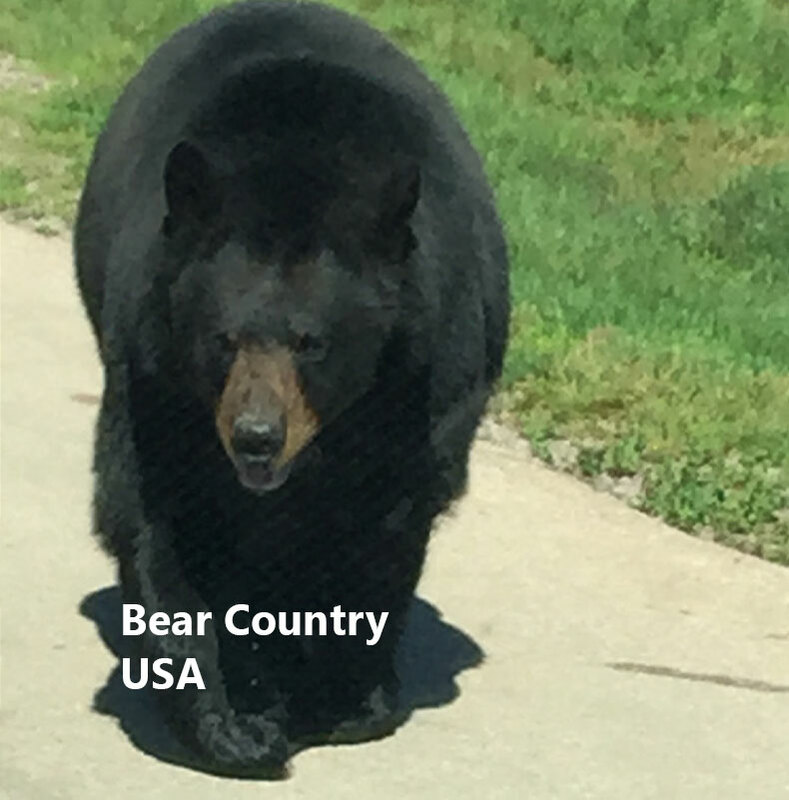 We also took a visit to Bear Country USA. Here, you will drive (with your windows up) through a park with roaming bears close by. The drive will take about 45 minutes, and I predict you will get some awesome looking photos, right from your car. 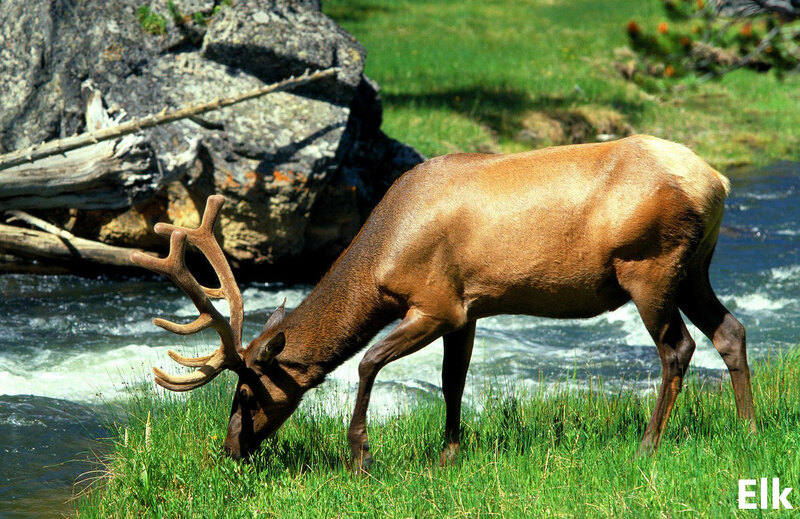 While there in the park, you may also see: Artic Wolf, Buffalo, Coyote, Elk, Grizzly and Black Bear, Mountain Lions, to mention a few. They boast around 20 species. The larger species roam freely throughout 250 acres of the drive-thru park. SATURDAY: Today, we start out on our final road trip, driving back to Denver. We took, however, a small detour to stop in at the Mammoth Site of Hot Springs, South Dakota. Many mammoth remains, preserved in an old sinkhole, are shown off at this museum and research center. Originally a sinkhole that trapped a lot of mammoths (and other animals) over the years, it is now one of the best excavation sites of mammoth remains on display. Here we are, back on Southwest Airlines once again, heading home, looking back, our journey now behind us. Our trip was more than beautiful and fun, exciting and safe. It could not have been nicer.